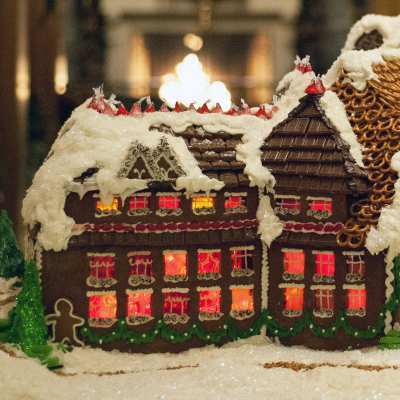 Saturday, December 14 - Sunday, December 22 — Select Dates, 1:00 p.m.
Make the kind of holiday memories that last a lifetime—gather friends and family for the fun-for-all-ages tradition of creating a gingerbread house! Seating is family-style and The Inn's pastry chef will be on hand to assist you as you decorate your house with a wide selection of colorful candies. Enjoy assorted tea sandwiches and desserts from our Holiday Tea menu. Seasonal cocktails are also available for an additional charge. Available on December 14, 15, 20, 21, and 22. Available to overnight guests, Passholders, and guests with Daytime Admission. Call 800-411-3812 to reserve.